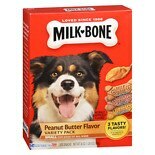 Shop Milk-Bone Dog Treats Variety Pack Small Peanut Butter (24 oz. )24 oz. $549$5 and 49 cents$0.23 / oz. 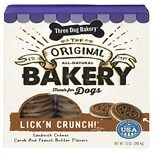 Shop Three Dog Bakery Lick'n Crunch, All-Natural Sandwich Cookie Treats for Dogs Peanut Butter (13 oz. )13 oz. $549$5 and 49 cents$0.42 / oz. 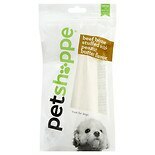 3 for 12 dollars and 00 cents or 1 for 4 dollars and 99 cents 2/$10.00 or 1/$5.99 $0.57 / oz. 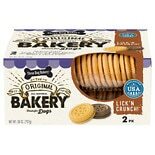 Shop Three Dog Bakery Lick 'n Crunch 2-Pack Carob & Peanut Butter/ Golden & Vanilla (26 oz. )26 oz. $899$8 and 99 cents$0.35 / oz.